The perfect DIY favor for your special holiday event, our Personalized Mini Gift Tote Favors are festively personalized and ready to be filled! We include a custom insert card that features your choice of holiday design along with 3 lines of text. 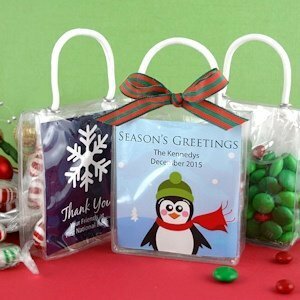 Fill the totes with Hershey's Minis, M&M's, Jordan Almonds or a small favor of your choice then send them home with your guests. Totes measure 3" wide x 3.5" high. Some assembly required. Contents and ribbon not included.